How has being in a school with a one to one Initiative changed your education? Being in school with the iPad has really changed the hole learning program for students. It has allowed students and teachers to enhance their technology knowledge. You can search the web, learn about different topic issues around the world with your classmates and professor right along with you. This whole new aspect of learning has not only enhanced the technology but the bold ideas increased by the students. How can an iPad increase learning? 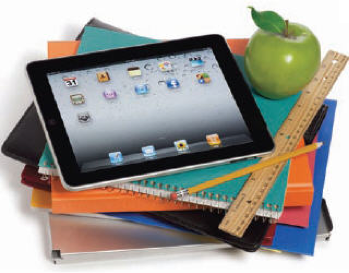 By high interest student engagement, iPads offer learning apps that can put a laser like focus on academic needs. Which is great for students and teachers to see where their strengths and weakness. The iPad and airplay allow us to demonstrate a procedure just once, record it, and play it on the big screen for all the students to view and discuss. The idea was to build on the school’s tradition of hands-on instruction by using a device that was rewriting the rules for interactive learning. The iPad has changed the experience of school in many ways. The iPad has had a neutral effect on everyday life in school. It has helped with the development of ideas and made research a lot easier. In contrast its made school lectures in class impossible to sit through without fidgeting with the iPad. Another positive about the iPad is that its made organization so much easier. My backpack has never been lighter then it is now because my iPad holds most of the information i need from textbook. So i don’t have to carry textbooks around. All in all its made life so much easier. Being in school with these iPads has really changed me personally. It has changed me because instead of bringing binders, notebook, and textbooks to school all we bring to school now are the iPads. I think that having the iPads are better because that way if we need to do a research we could do it in our seats instead of having to go down to the media center or having to get the laptop cart.